Interloper! (132/365 year 3) – Annoyingly Boring? 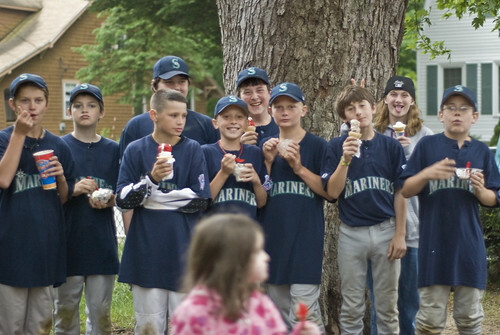 It was hard enough to get the team (or those who made it for Dairy Queen after the victory at least) to all look at the camera, not obscure each other and stand still. Then Re decides to walk through the shot. Oh well. Congrats to the Mariners. They won their semi-final against the top ranked Mets Sunday and will now face off the Phillies in a best of three championship series. Only bad part is I will not be manning the first base coach box. I will be at work each of the nights. Ha! I got one of these shots, too — only with my daughter’s soccer team… Maybe I’ll post it.